Visitors often wonder how Palmer Coking Coal Company came to own the property known as Shangri-La. The property is located in Section 19-21-7 east of the Green River. The old Pacific Coast Coal Company purchased the property from the Oregon Improvement Co. after OIC entered bankruptcy in 1896. The Oregon Improvement Co. had acquired this odd numbered section 19 from Northern Pacific Railroad in 1891. The property was originally part of a land grant to the Northern Pacific Railroad in the 1870s for construction of a trans-continental railroad. In the early part of the 20th century, an underground coal operation known as the Hyde / Cannon mines was operated on both sides of the Green River. Evidence of this historic mining at Shangri-La can be seen below the wooden bridge where coal slag material was stockpiled and used to create a level site. The hanging bridge further downstream was used to convey coal over the Green River when the underground coal mine was active. That same bridge is now used by the City of Black Diamond for moving water from the Black Diamond springs through water pipes to the town. In 1948, Pacific Coast Coal Company sold approximately 28 acres of land along the banks of the Green River to Lawrence & Doris Garner and Wallace & Carmen Riley. Shortly after the purchase, the Riley’s conveyed all of their interest in the property to the Garner’s. In 1956, Lawrence Garner obtained a Certificate of Surface Water Rights for streams flowing through the property. Lawrence Garner constructed a number of improvements to the site including ponds, water storage and conveyance facilities, toilet facilities, septic tanks, drain fields, and several structures. An old road leading to the Hyde / Cannon mines was improved and a new road was constructed directly to the Enumclaw-Franklin Road. In 1953, Pacific Coast Coal Company sold another 28 acres of property due south of the Garner property, to James & Marie Tonkin. In 1969, the Tonkin’s sold their holdings to James & Barbara Cantrell and Stuart & Delores Robertson. In 1968, the Washington State Parks and Recreation Commission released a study recommending acquisition of property along both sides of a twelve-mile stretch of the Green River between the towns of Palmer-Kanaskat and the Flaming Geyser State Park. Palmer Coking Coal Company had previously acquired all of Section 19-21-7 (except the Garner & Tonkin properties, and City of Black Diamond watershed site) from Pacific Coast Coal Company in 1956. By the late 1960s Palmer was operating one underground coal mine on the east bank of the Green River and had recently closed another. The active mine was called the No. 10, named after one of the seventeen coal seams of the Franklin series. The No. 12 mine had closed several years earlier. A wooden bridge with narrow gauge rails for small coal cars crossed the river and provided access to the west side where flatter ground made coal removal by dump-trucks easier. In March 1971, Rocket Research using special explosives blasted the old bridge down. The ceremony was attended by many State and local dignitaries as well as television crews from NBC for the monthly documentary program called “First Tuesday” shown in May of that year. 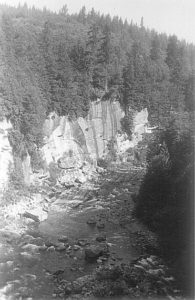 In 1970, Jack Morris, President of Palmer Coking Coal Company, Inc. entered into negotiations with the State of Washington to convey approximately 290 acres of property in Section 19 (230 acres) and Section 30 (60 acres) for a major park and central link in the Green River Gorge Conservation Area. A conservation easement on 16 acres of land north of the Garner property, comprising the east bank of the Green River above the old coal mines, was also included in the acquisition. The Washington State Parks & Recreation Commission has traditionally referred to this large property acquisition as the “Hanging Gardens” site. This particularly beautiful area with vertical walls and lush vegetation is located at a sharp bend in the river about 1/2 mile downstream from Shangri-La. “Shangri-La”: a remote, beautiful and imaginary place where life approached perfection as depicted in the 1933 novel “Lost Horizon” by James Hilton; i.e. utopia.